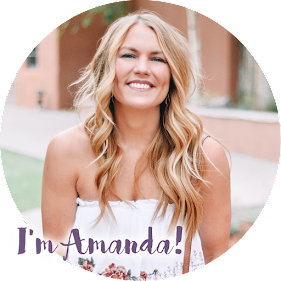 After taking a little break from our 2018 monthly travel plan, it was so great to hop on a jet plane and get away for a weekend! 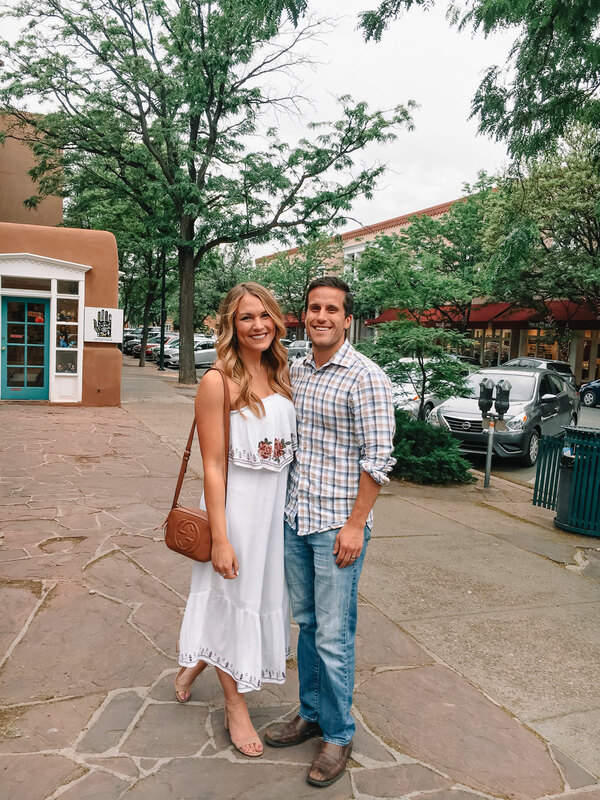 We headed to Santa Fe, New Mexico over Memorial Day for a little three-year-anniversary trip and had such a fun time. It was short, but oh so sweet. 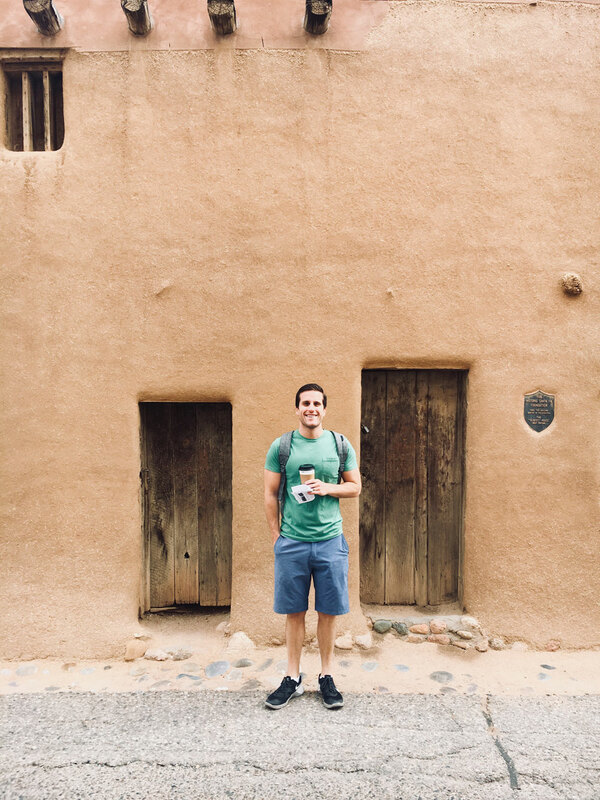 Both C and I had been to Santa Fe when we were kids - it seemed that the only thing either of us really remembered was the courtyard of the Loretto Chapel and the staircase inside. Go figure! Going back as adults really let us appreciate the uniqueness of the city. The architecture, the climate, the beauty....even the way it smelled! I've never been anywhere that smelled so good - almost like laundry detergent in the air everywhere you went! Everything was SO pretty, it was like we were in Instagram heaven! Though we aren't huge fans of the Santa Fe style necessarily (i.e. not how we would decorate our house, not a lot of clothes/jewelry I would wear), we were still able to enjoy it and appreciate it. And of course, the food! We didn't eat a bad meal. 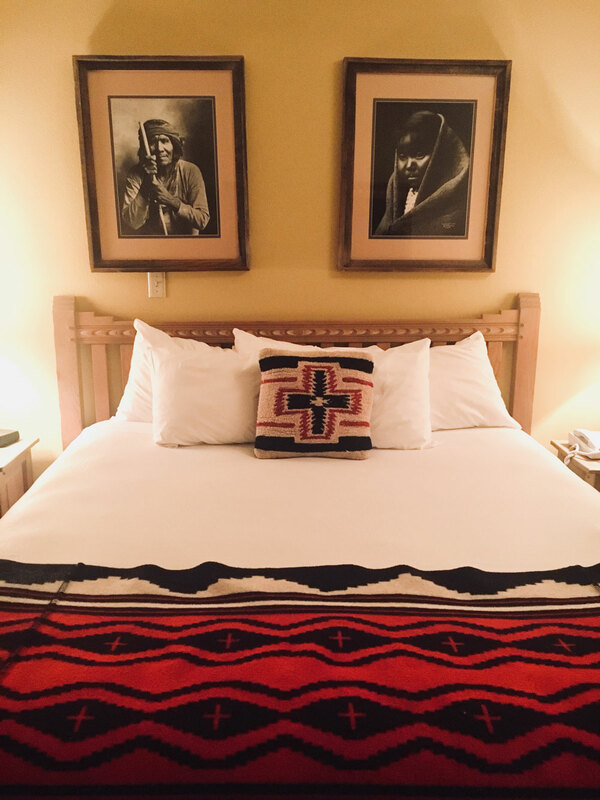 We planned to be in Santa Fe for three days and two nights. Due to flight delays, we missed most of our first day with the exception of dinner (bummer) and had to skip a few of the activities we had planned, but I still feel like we had roughly enough time to explore the city itself. 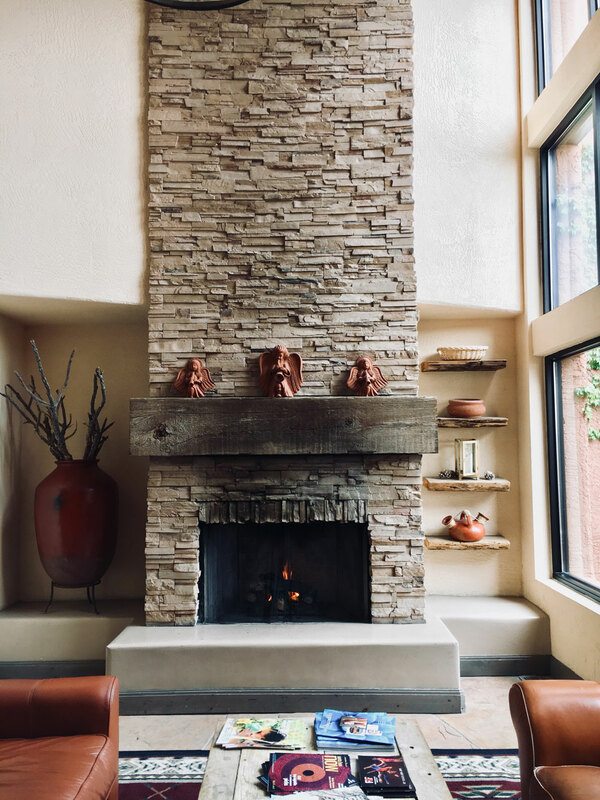 I would have liked to have an additional day there to visit Taos and the Rio Grande Gorge or to relax a little at a spa or pool, but we'll save that for the next trip out west. • If you're flying, fly into Albuquerque and rent a car. Santa Fe is about an hour away from the "sunport." You can event take the scenic route up the turquoise trail which will only add an extra twenty or so minutes to your drive. • The city more or less shuts down around 8 or 9 p.m. so plan dinner and drinks accordingly! • Parking is absolutely terrible around the touristy areas of town, so be prepared to park, pay for parking and walk a lot so you don't have to move the car! Luckily everything is very close and walkable. • It seemed like most restaurants in town don't serve liquor, only beer and wine. We found it very difficult to find a margarita! 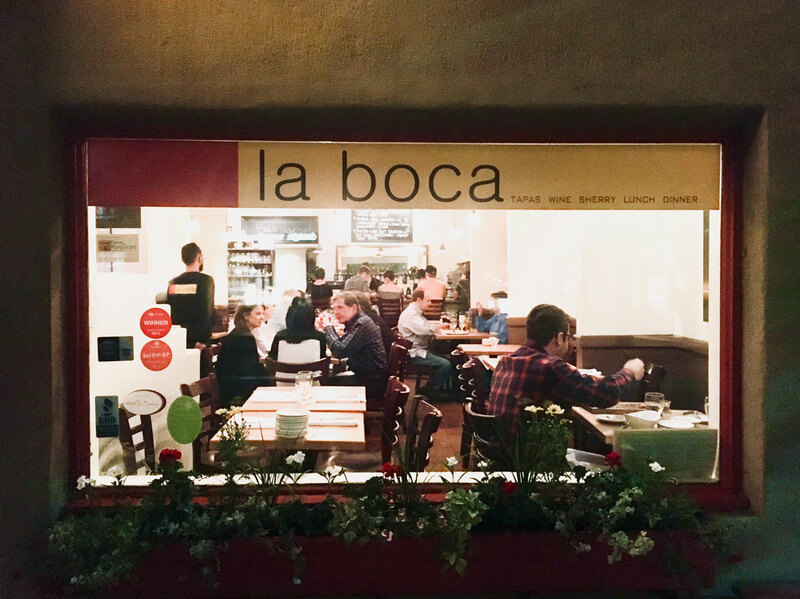 • La Boca - we ate at this Spanish style restaurant on our first night in Santa Fe and they treated us so well. We had to push our reservation back several times due to flight delays but I'm so glad we made it before they closed! It reminded us of several places we ate at in Europe. This was our "nice" meal - it was a bit on the pricy side and was a good place to dress up a smidge for (which I love to do on vacay!). All of their dishes are tapas, meaning they are the size of an appetizer. We ordered five dishes to split and it was just the right amount of food. The noodle bowl was my favorite; it gets 10/10. 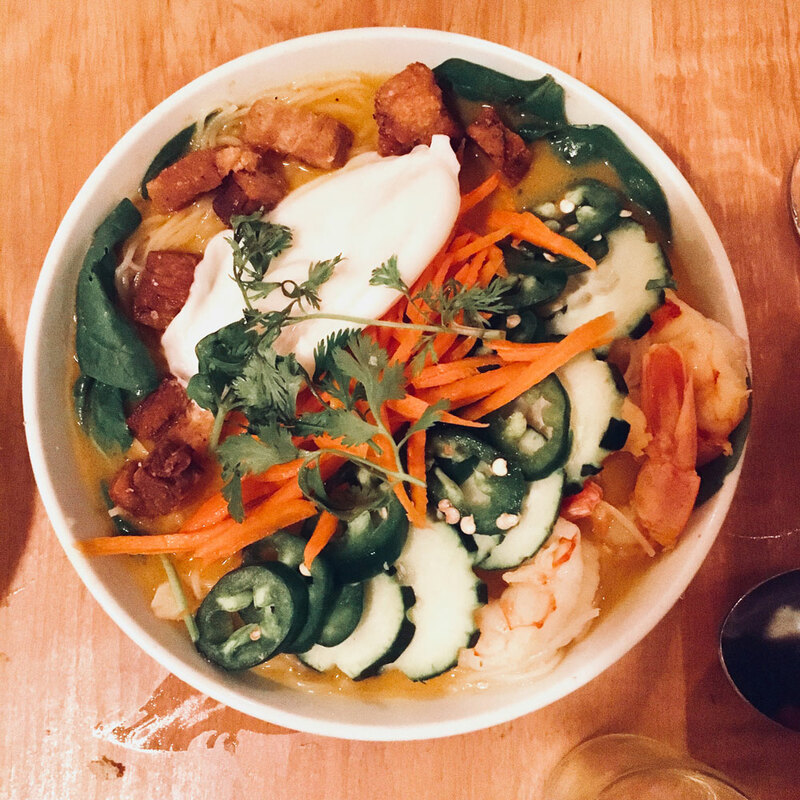 It was basically a Spanish ramen dish filled with cilantro, jalapeño and shrimp. The broth was a lot lighter than ramen, though, which I liked. We also enjoyed the steak with salted caramel sauce and one of their specials made with morrell mushrooms, serrano, cheese and pinion! 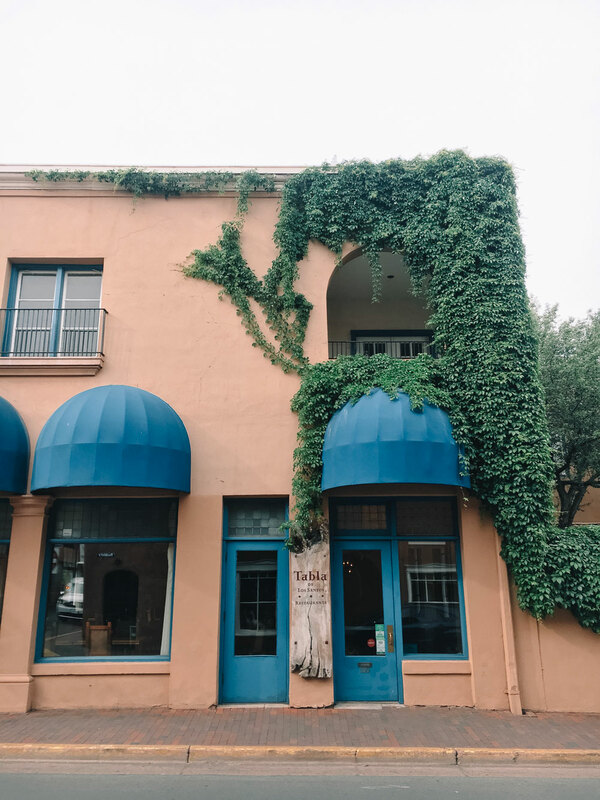 • Cafe Pasqual's - C and I agree that this was our favorite meal of the trip! We heard the wait can be bad because they only seat 50 people at a time, so we planned to arrive right when they opened for breakfast at 8. Well.....we got there at 8:08 and it was already completely full! Luckily we only had to wait about 30 minutes...just enough time to get coffee next door and walk around a bit. 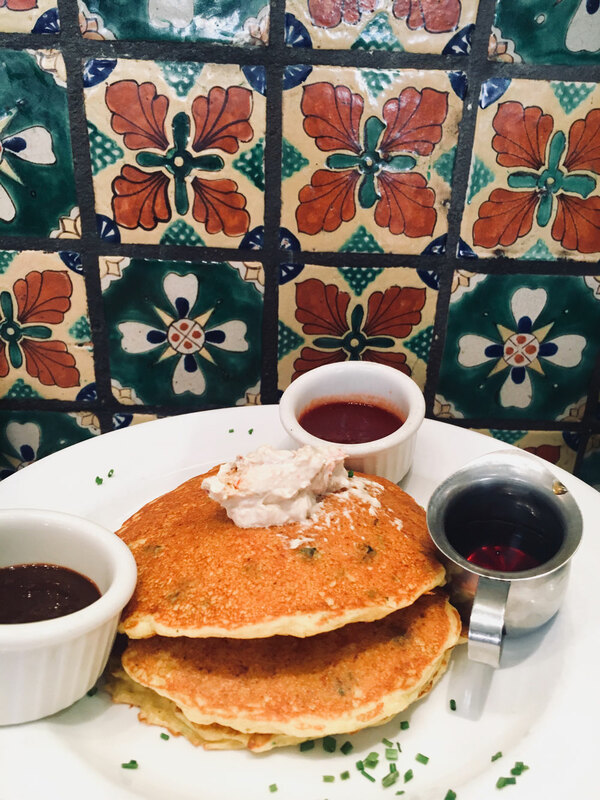 I ordered the corn pancakes and they were out of this world delicious. C ordered the smoked trout hash which was great, as well, but the pancakes stole the show! If you eat anywhere in Santa Fe, eat here! 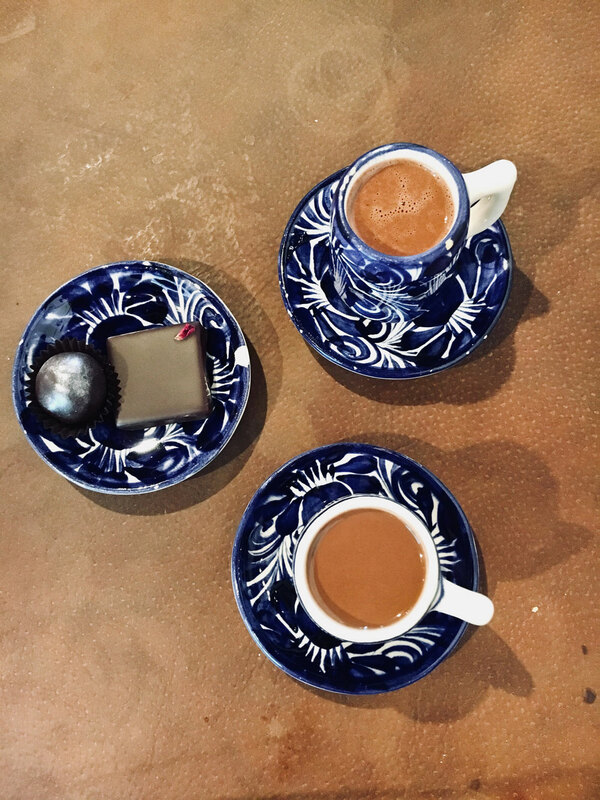 • Kakawa Chocolate House - After trying Parisian hot chocolate, I was excited to give Kakawa Drinking Chocolate a try! In my personal opinion, it was way better than in Paris! This hot chocolate was a bit lighter/thinner and it had so much more depth and flavor to it. They let you sample as many elixirs as you like - I tried several but ended up going with the Marie Antoinette. It had a hint of orange blossom and was absolutely delicious! We also tried several of the chocolates - the rose caramel might be one of the best candies I've ever tasted (and that's saying a lot). 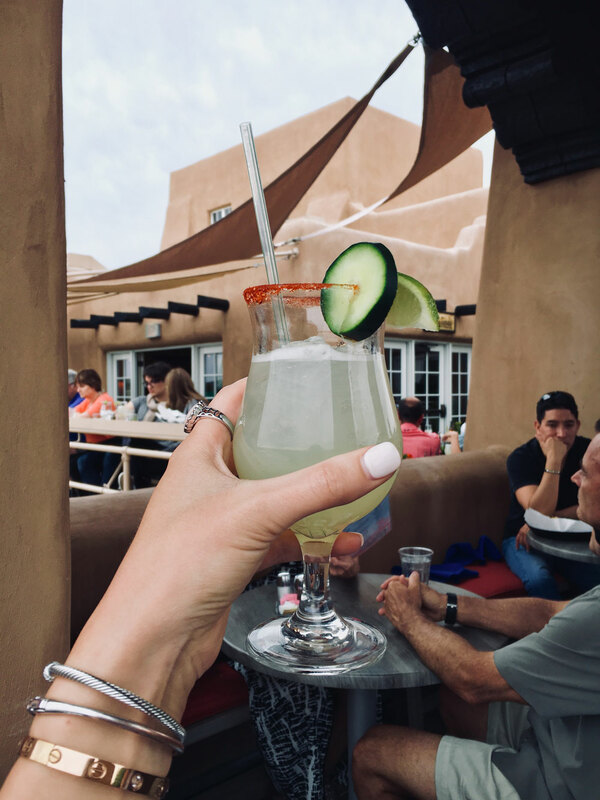 • La Fonda Hotel Bell Tower Bar - As I mentioned earlier, it was way too difficult to find a place in town that served margaritas! We went to the Bell Tower Bar for the sunset views (which were nice, mind you) but their margs were the best part of the experience. They had several different varieties and flavors but they were all delicious and super fresh. Note that they close an hour after twilight and they get pretty packed in the evenings! 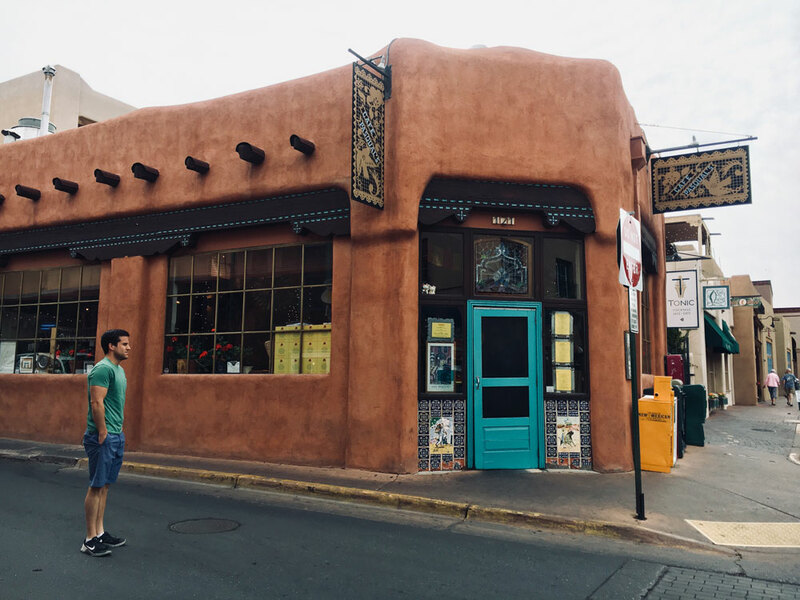 We also ate breakfast at Tune Up Cafe, had great americanos at 35 North, tasty green chile burgers at The Santa Fe Bite, bright blue margs on the Coyote Cafe and Cantina rooftop and we got our "Christmas" enchilada fix at Frontier in ABQ! 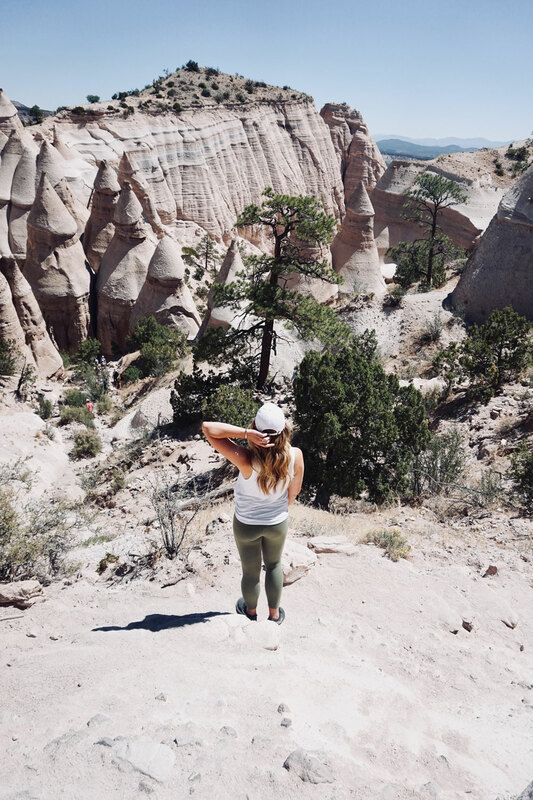 • Hike Kasha-Katuwe Tent Rocks - I could probably do a whole blog post on this alone but it was definitely the highlight of our trip! It was about 45 minutes outside of Santa Fe and totally and completely worth the drive. We arrived around 10 a.m. and we had to wait about 25-30 minutes to get into the park because they were at capacity. They said sometimes you have to wait up to 90 minutes or more just to park! It costs $5 cash to park and they prefer exact change. There are two trails, Cave Loop and Slot Canyon. Both are about 1.5 miles, I believe. 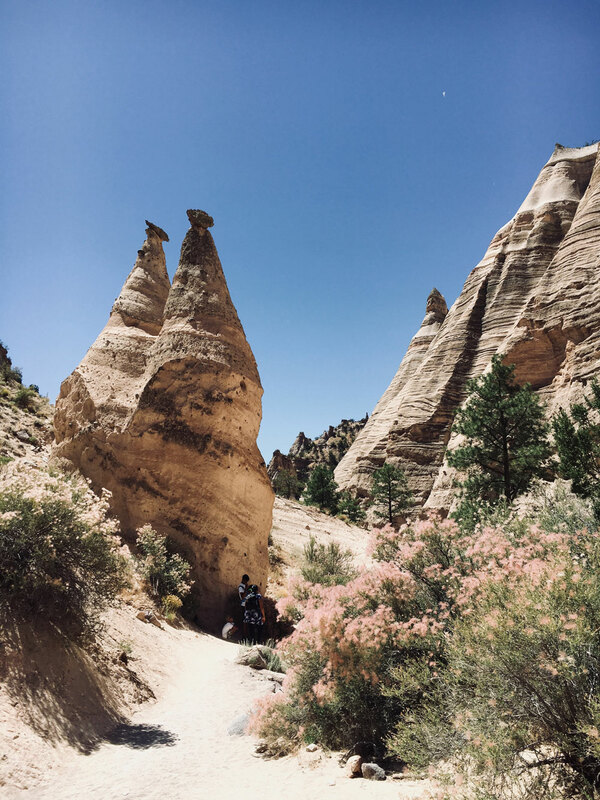 We took Slot Canyon which walks you through the slots (SO COOL) and then takes you to the top to look out over the tent rocks from above. It seriously felt like we were in Star Wars on Tatooine! The hike started out easy but got difficult towards the top. It wasn't too steep of a climb, but there were some rocky spots where you had to step carefully and pull yourself up, as well as some major drop offs. I plan on doing a "staying fit while traveling" post next week and including all the pictures from this hike, so stay tuned for that! 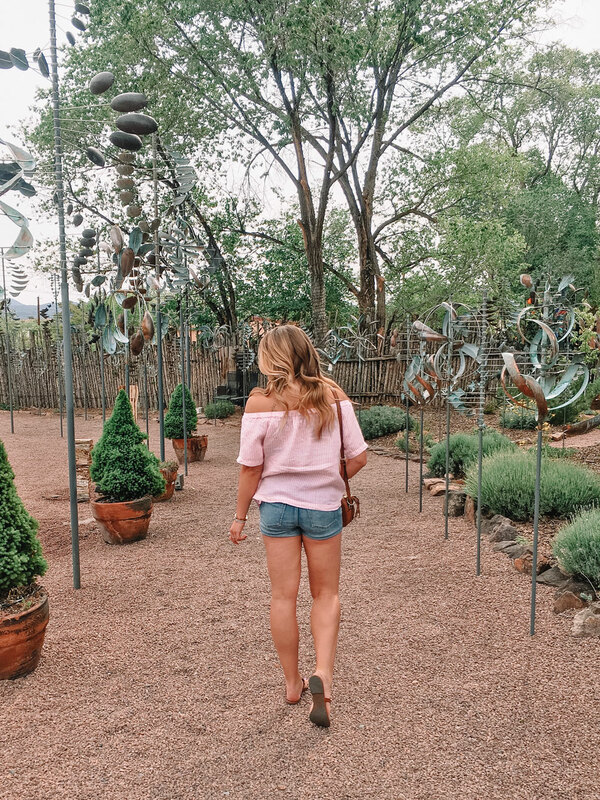 • Loretto Chapel - a quick little must do when visiting Santa Fe! 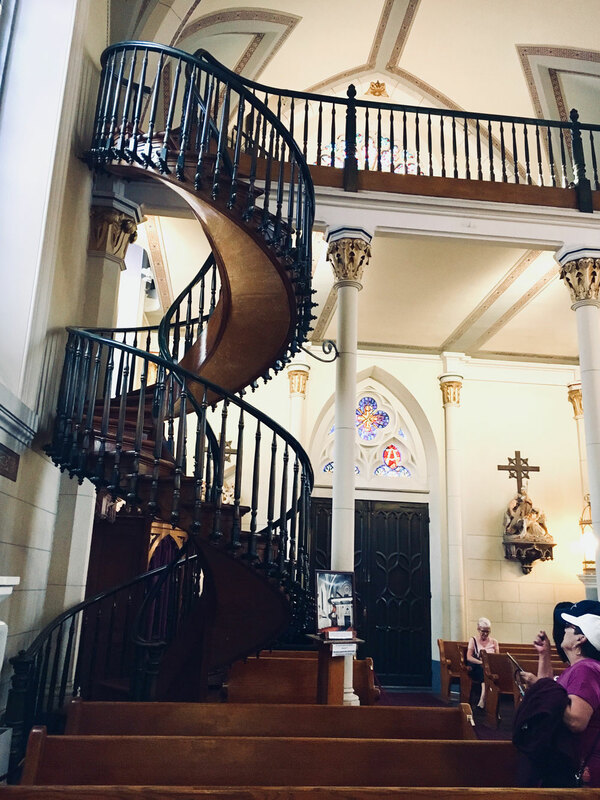 The staircase at the Loretto Chapel is amazing, as is the story behind it. There are no major supports and nothing holding the staircase up. It costs $4 to get in, but it is really neat to see and the church is lovely, as well. There were a ton of people there so I wasn't able to get a good photo, but it is beautiful to see! 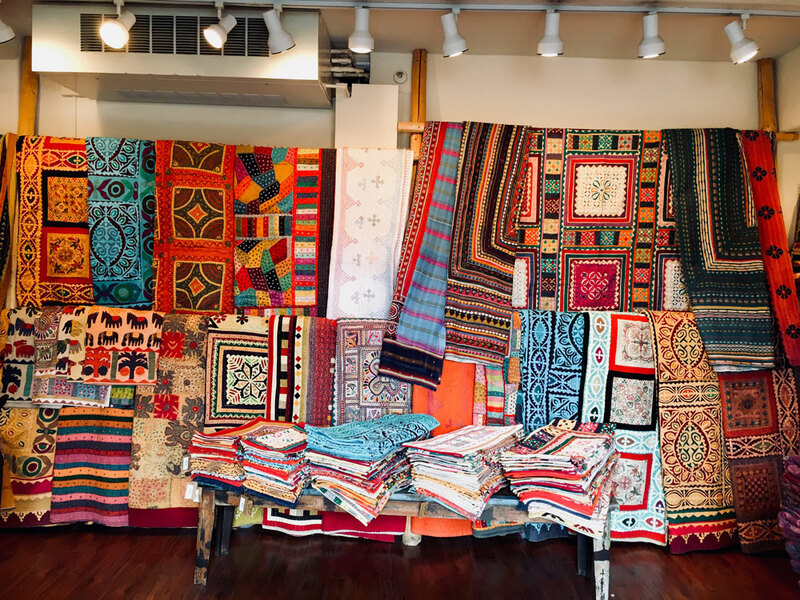 • Canyon Road - a must for art fans! C and I aren't big art people so we didn't go into many of the galleries, but we did enjoy walking through the outdoor garden art area. • De Vargas Street House - it claims to be the oldest house in the U.S., though several others make the same claim. It was still cool to see and was free to walk through. 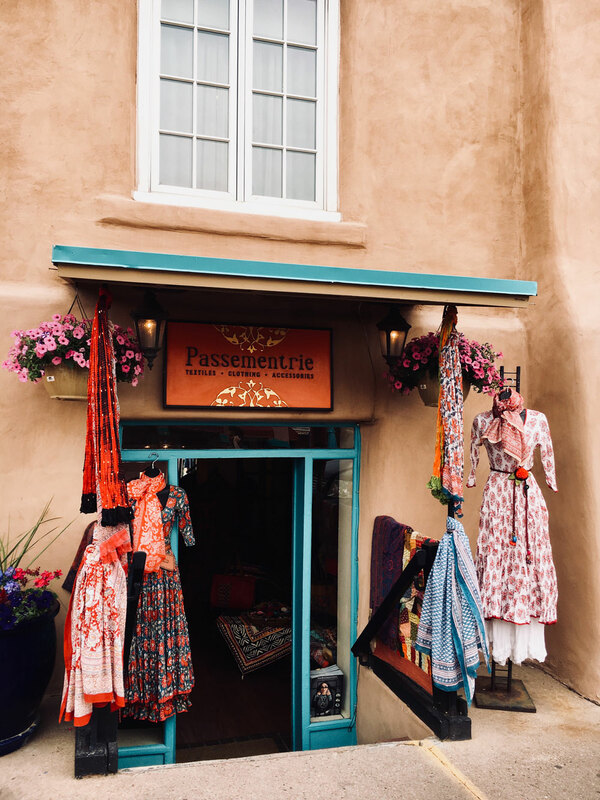 • The Plaza - the touristy area of town with all the gift shops and art galleries. So. Much. Turquoise! • Railroad District - there are several big stores here (like R.E.I.) as well as a few boutiques. The Santa Fe Farmers Market takes place here on Saturdays. It was paaaacked when we were there. • Look What the Cat Dragged In 2 - a little vintage thrift store where you can supposedly find some designer items if you're lucky! I wasn't so lucky, but it was still fun to search. 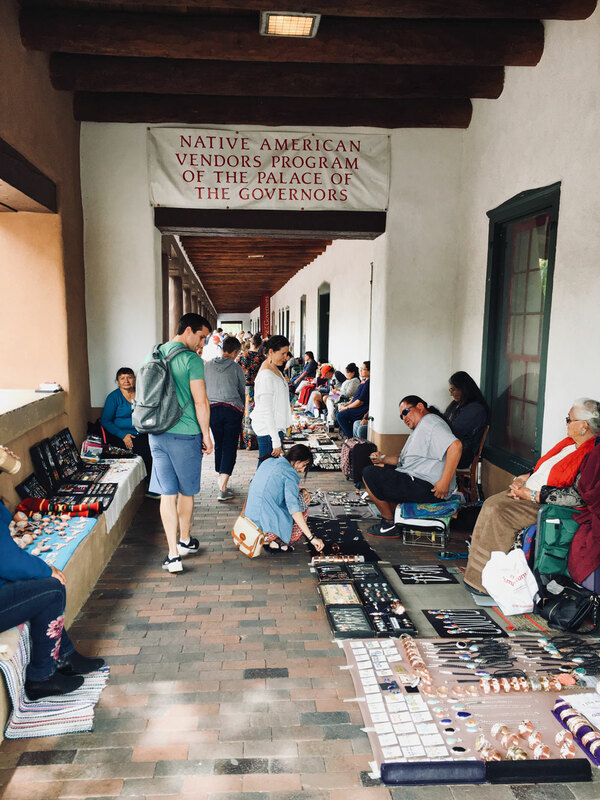 • Palace of the Governor's - this is where the Native Americans sell jewelry! 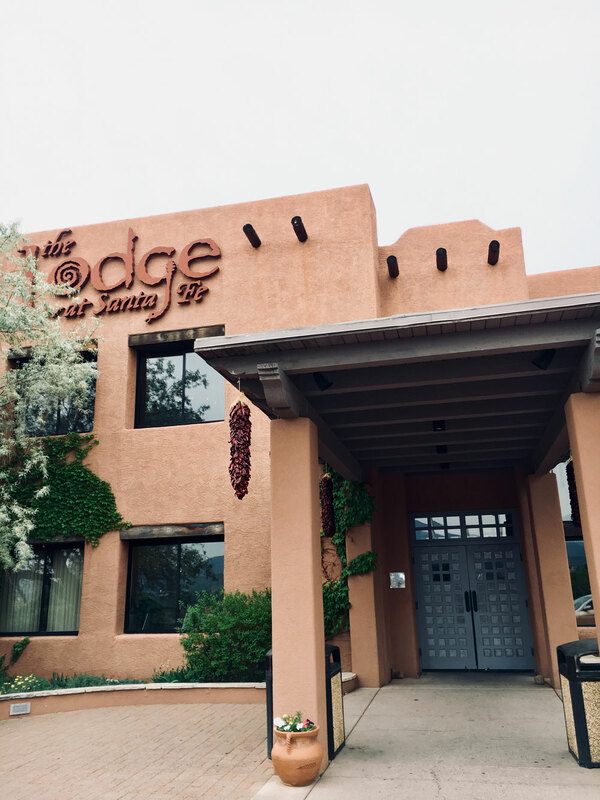 We stayed at The Lodge at Santa Fe which was just a few minutes drive from the plaza area. It was nice to be away from the hustle and bustle and to have plenty of parking! The rooms were HUGE, decorated nicely, and the beds were super comfy. It was also relatively affordable in comparison to the hotels in the heart of town and it had a great pool area with a view. The grounds were stunning; we saw several bunnies and prairie dogs on the property which was fun. I would recommend it and would definitely stay there again. The only downside was that having to drive to the plaza and park there (as opposed to having a parking space reserved for you and walking out your hotel door to meander around town) was a bit difficult. The hotel did have a free shuttle, though, we just didn't utilize it. There ya have it! Santa Fe in a nut shell. Like I said, I would have liked a bit more time to explore outside of town, so I'll have to go back to The Land of Enchantment. 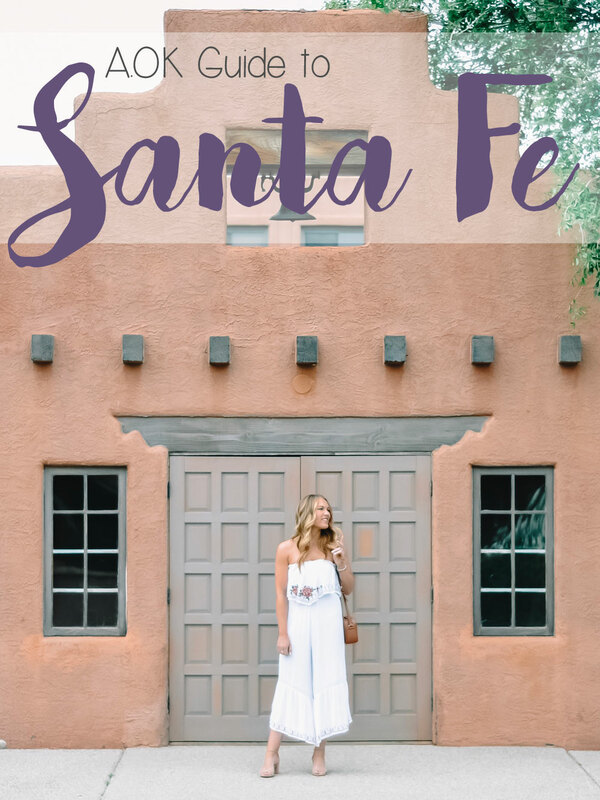 Have you been to Santa Fe? If so, what places would you recommend? Our next trip is less than two weeks away!! Heading east this time to a southern city with great music and delicious food around every corner. Any guesses?